Soon the place will be loud with raucous youngin', aged five to about 12, but before they come, someone finds a basketball, and "Mighty Mouse", Hall and Bryant shoot some hoops. They're awful. Which is to be expected. If Johnson and Hall didn't spend all their time practicing to be awesome fighters, well, they wouldn't be awesome fighters. But it's almost comical how the UFC champ misses even the easy layups. However, when the room is full of kids, many of whom are acting out and unaccustomed to having to pay attention and be polite, Johnson and Hall excel (for years Hall taught the kids' classes at the Manhattan Tiger Schulmann school). Bryant leads off the discussion by explaining what the sport is and who the two men beside her are - a necessary explanation given that these kids are nowhere near MMA's target demographic. Yet the kids recognize Johnson and Hall for fighters, and when the duo demonstrate some techniques, everyone is enthralled. The Q&A session leads to some hilarious moments. 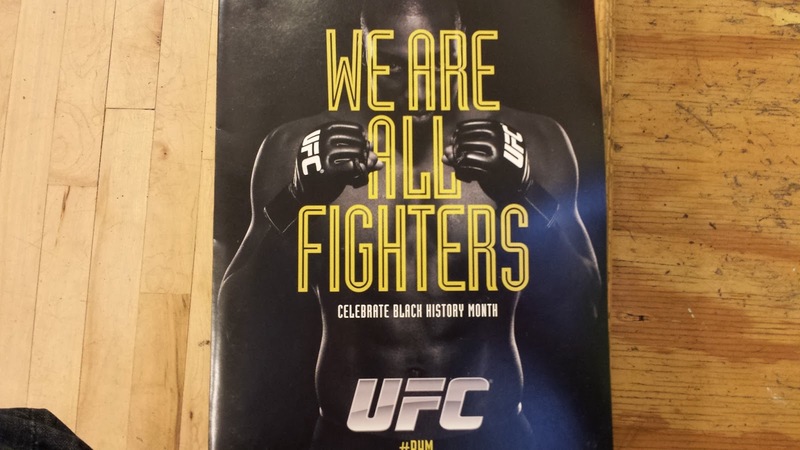 One kids raises his hand, and when Johnson calls on him, he says, "The UFC is bad because they make people bleed." Johnson hits that knuckleball back with the old "contest between skilled fighters" retort. Hall, meanwhile, is asked if he could beat Brock Lesnar. Dealing with bullies seems to be the underlying message Johnson and Hall try to put across - a topic maybe not so apropos of Black History Month, but hey, you try talking to a hundred crazy kids. When the session draws to a close everyone gathers around for a group photo. Then the kids line up, and the champ and the TUFer go to work furiously autographing pics and handing them out. Will this be the year Johnson, Hall and the rest of the UFC clan will finally be allowed to fight here? Maybe, maybe not. But the UFC will come either way, making their presence known to the media, the politicians and the kids. Given the circumstances, what more could you ask for? As we're heading out, I ask my daughter if she had fun. In her hands is a signed pic from Johnson. She says "yes" with a smile. Thus ends 7 days in NYC.